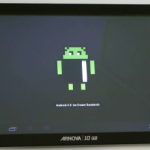 Arnova has published a new section in their FAQ to explain how to Factory Reset the Arnova 8 and Arnova 10 tablets. This procedure helps you to flash a device in a simpler manner than the Rockchip RK28xx Flashing Tool. This procedure is currently deployed only in Arnova 8 and Arnova 10 firmwares, while the rest of Arnova FAQ is valid for all first generation devices: Arnova 7, 8, 84, 10 and 10b models. Arnova G2 devices are not yet equipped with a recovery allowing Factory reset and flashing from SDCard. How can I do a Factory Reset on my tablet? If your tablet freezes often or if you get error messages during the start up of your tablet, you can use the recovery mode to reset your tablet to its factory settings, removing all installed applications as well as any data or content. Your tablet must be up to date with the latest firmware – downloadable from the downloads area of this website. Thanks to Jbmm.fr for the info. Podrían decirme como entrar en modo Recuperación a fabrica. Con un clip le doy a Reset y al mismo tiempo pongo el cargador y luego que botones debo pulsar el power, el menú o esc. o el de la pantalla? Muchas Gracias. Perdon en la Tablet ARNOVA 8. I have Archos Arnova 7 (G1) and want to do a factory reset. How i can do it`? I have tried this several times but it will not boot to recovery. I have an a101b. I cannot flash any updates either. All img files return as invalid. Any idea what is going on? j’ai les meme symptomes que KJRob30 , impossible de faire un reset factory ni flacher la rom ( officiel ou alternative) message d’erreur image invalid. I have tried this but I still have some files and documents on the “disk”. Do you know the way to erase and recreate the complete disk content ? Funny… I have gotten this same screen to show up on the Arnova 10G2 however you cannot select anything. The volume up and down move through the menu but there is no way to select anything. Touch screen does not work in this mode on the 10 G2.